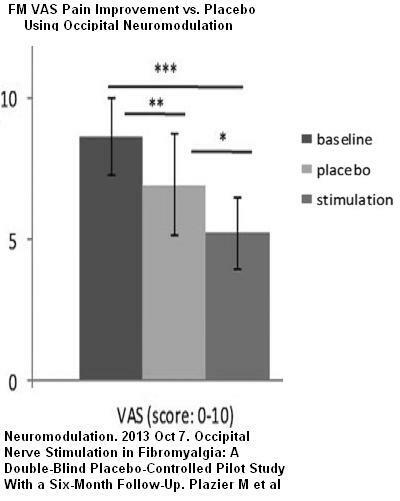 Occipital Stimulation dropped FM pains from 8/10 to 5/10 while placebo only decreased it from 8/10 to 7/10. Occipital Nerve Stimulation in Fibromyalgia: A Double-Blind Placebo-Controlled Pilot Study With a Six-Month Follow-Up. Plazier M, Dekelver I, Vanneste S, Stassijns G, Menovsky T, Thimineur M, De Ridder D.